June 16 marks one year since the birth of a bouncing baby fraud theory — implied certification — which attaches False Claims Act liability to contractors that request payments while concealing the failure to comply with critical requirements. Such as, perhaps the use of air base security guards that can’t pass marksmanship tests in United States v. Triple Canopy Inc. Although the young Supreme Court decision, Universal Health Servs., Inc. v. United States ex rel. Escobar, has grown over the past 12 months, numerous questions still need answers before implied certification can walk steadily on its own. Do we know more about materiality now? 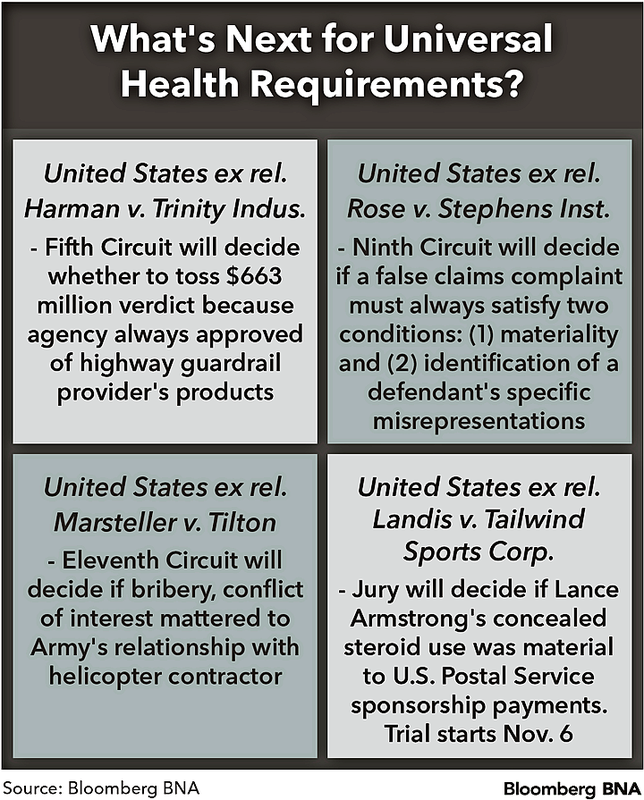 Supreme Court Justice Clarence Thomas’s opinion avoided a clear-cut definition of materiality — which concerns whether contractual noncompliance has the tendency to influence a government payment decision — and has been a major point of contention among litigants. Is highlighting continued contract payments from the government despite knowledge of wrongdoing the strongest anti-materiality defense? One or two steps? Courts have disagreed as to whether a valid complaint must merely establish materiality, or if it must also identify specific misrepresentations a defendant made about its products or services to the government. Will the Supreme Court have to clarify itself? What will the president and attorney general do? The Justice Department obtained more than $4.7 billion in cases under the FCA in fiscal 2016. Will implied certification help the new administration grow that amount? What’s the next big ruling? The contours of Universal Health will be shaped by highway guardrail provider Trinity Industries Inc.'s effort to throw out a $663 million jury verdict at the Fifth Circuit, as well as a trial against cyclist Lance Armstrong, among other rulings. Courts will soon provide a big piece of this puzzle to both whistle-blowers and defendants. Any day now, the Fifth and Eleventh circuits could issue rulings on whether a defendant can dodge a false claim if the government continued to pay it despite knowledge of contractual noncompliance. Thomas didn’t issue a crystal-clear three-part materiality test, and that lack of clarity has led to court conflict since the decision, Eric R. Havian, partner with whistle-blowers’ law firm Constantine Cannon, San Francisco, told Bloomberg BNA. Some courts continued to apply a narrow interpretation of the FCA, despite the Supreme Court’s rejection of rigid categories, Havian said. “Unfortunately, the opinion contained a few poorly worded passages that some courts have misinterpreted,” he said. That opaqueness is apparent in Thomas’s view that the government’s decision to expressly identify a provision as a condition of payment is relevant, but not automatically dispositive of materiality. If the government pays a claim despite its actual knowledge that certain requirements were violated, that is strong evidence that those requirements are not material, Thomas also said. The starting point for materiality “is always going to be whether the government would have paid the claim if it knew of the alleged falsity,” David P. Honig, a false claims defense attorney with Hall, Render, Killian, Heath & Lyman PC, Indianapolis, told Bloomberg BNA. Defendants have repeatedly argued that materiality is lacking, and therefore a case fails, if the government knew about noncompliance but continued to pay. This defense “will be effective, but only where the government knows, not just of the claims, but of the alleged error or falsity. The degree of knowledge, unless obvious, can be a factual issue for a jury to determine, and the defendant’s goal is always to resolve the case, preferably through dismissal, rather than go to trial,” Honig said. Establishing materiality requires pleading facts that demonstrate the significance of the alleged false certification, not just the fact that one exists, Michael A. Filoromo III, partner with plaintiffs’ firm Katz, Marshall & Banks LLP, Philadelphia, told Bloomberg BNA. “Beyond that, materiality remains a fact-specific, case-by-case inquiry as courts try to establish guideposts and the outer bounds of FCA liability,” he said. The government knowledge defense is the “tip of our spear” but “is no longer a silver bullet,” Robert Rhoad and Matthew Turetzky, false claims defense attorneys with Sheppard Mullin Richter & Hampton LLP, Washington, told Bloomberg BNA in a joint email. How much government knowledge gets you to no liability? Does it need to be somebody duly authorized to make payment decisions for the government, or can it be anyone in the government? What if one agency knows but another doesn’t? Does the government’s failure to communicate with itself result in liability? Practitioners know there can be many reasons for continued payment, including that the product or service is essential and the defendant is the sole source, he said. The debate nevertheless may persist for quite some time. “What better way to distinguish contract breaches that should be handled administratively from actionable fraud than how the supposedly wronged buyer — the government — treated the alleged violation?” Dennis J. Callahan, shareholder with false claims defense firm Rogers Joseph O’Donnell, San Francisco, told Bloomberg BNA. BP Exploration and Production Inc. and Kellogg, Brown & Root Inc. notably used this approach to defeat cases this winter. KBR highlighted how it received an exceptional performance fee from the Army under a logistics contract despite allegations of overbilling; BP showed how the Department of the Interior allowed it to continue drilling for oil despite allegations of regulatory noncompliance. Contractor MD Helicopters said claims against it can’t be revived because the Army continued to pay and award the company contracts despite knowledge of an associate’s bribery and conflict of interest. The helicopter case, United States ex rel. Marsteller v. Tilton, which held oral arguments in February, is of particular interest because the government directly challenged the Supreme Court’s interpretation of materiality by saying the statute defined it more broadly, Honig said. Could a run of success for defendants with this defense prompt congressional intervention to amend the FCA as it has done in the past? Plaintiffs’ attorneys would want a diluted materiality requirement that views the “tendency to influence” standard as objective, and without inquiry into what actually occurred in the agency, said Roderick L. Thomas, partner with Wiley Rein LLP, Washington. “That crabbed reading should be long gone,” he said. The government’s continued payments despite actual knowledge of noncompliance should preclude materiality, “but based on how courts have read the Supreme Court decision,” Thomas said. “However, we doubt the defense will become so strong that Congress would adopt a myopic view of materiality,” he said. A new materiality factor may have emerged from a May 16 Fourth Circuit ruling, United States v. Triple Canopy Inc., that allowed the government to move forward with its case that it wouldn’t have paid security contractor Triple Canopy Inc. if it knew its guards lacked marksmanship proficiency. The government succeeded in part because, once it learned of the contractor’s noncompliance, it intervened and joined a whistle-blower in his lawsuit against the contractor. It was a “big deal” for the court to place weight on the government’s intervention because, historically, courts have not, Turetzky said. A Split in the Making? Another consequence of Justice Thomas’s inexact opinion may be serious circuit court tension over what a valid implied certification complaint must allege at minimum. The Seventh and Ninth circuits have rejected false claims for their failure to identify specific inaccurate representations and failure to adequately allege materiality. In contrast, the misrepresentations prong isn’t always necessary, the U.S. District Court for the District of Columbia said May 19, stating that the law of the D.C. Circuit only demands satisfaction of the materiality condition. Whether a complaint needs both prongs is a “hot debate,” Douglas W. Baruch, a partner with Fried, Frank, Harris, Shriver & Jacobson LLP, Washington, said in February, after another District Court for the District of Columbia decision cleared the way for the government to take Lance Armstrong to trial for concealing performance-enhancing drug use while receiving U.S. Postal Service sponsorship payments. However, a classic circuit split with a stark divide isn’t likely, Honig said. “Rather, I expect cases and fact patterns to, over time, lead to slightly different ways the rule is applied, differences that will flex and change based more upon fact patterns than a conscious decision to go in direction A vs. direction B,” he said. Havian agreed that it is premature to call this a circuit split, although the issue is coming up frequently. A good case to watch, he added, is United States ex rel. Rose v. Stephens Inst., in which the Ninth Circuit will address whether a valid implied certification case must always satisfy the two conditions. Appellant Stephens Institute told the Ninth Circuit on May 30 that an education fraud case can't proceed because of whistle-blowers' failure to satisfy both the specific representations and materiality standards. Finally, it remains unclear how President Donald Trump and Attorney General Jeff Sessions will use Universal Health to expand upon the Justice Department’s $4.7 billion recovery under the FCA in fiscal 2016 — a $1 billion jump from fiscal 2015. Attorneys predicted before Trump’s inauguration that DOJ recoveries would remain largely dependent on whistle-blowers and apolitical personnel at the department, but that a big commitment to infrastructure spending could lead to an uptick in false claims litigation. Turetzky agreed that suits will follow if Trump’s $1 trillion infrastructure plan becomes law, but there is no certainty when it comes to Trump’s enforcement policy, he said. Sessions’s record and public statements indicate an intent to root out fraud, but the DOJ may not want to “risk intervening in implied certification cases unless it is clear that particular violations have been the basis for the government declining to pay claims in the past,” Filoromo said. One early test for Sessions’s DOJ was Constantine Cannon’s case against United Health Group, Havian said, which the DOJ recently joined by filing a complaint alleging single damages over $1 billion. “With such large stakes and such a powerful defendant, we were concerned about potential political influence, but have seen no evidence of that,” Havian said. “Moreover, as a check on improper influence, nothing piques the interest of the press like a story of powerful interests seeking to exert political pressure on government prosecutors. “If that changes, I suspect the Justice Department could become as leaky as the White House,” he said.